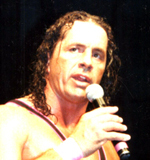 The Fight Network released their "Survival of the Hitman" documentary last night chronicling Bret Hart's return to WWE for a match with Vince McMahon at WrestleMania after a 12-year absence following Survivor Series 1997. The two-hour documentary can be found in the four videos below from the Fight Network's official YouTube page. Read what John Pollock of the Fight Network said about making the documentary and what went into producing the film. The documentary is below in four parts or it can be viewed on the official YouTube page. -- SEE ALSO: Read my Review of the documentary.